Fort Collins City Council adopted a goal of recycling or composting 75 percent of the community’s discards by 2020, 90 percent by 2025 and achieving zero waste by 2030. In 2013, the Fort Collins Community Diversion Rate was 64.5 percent. 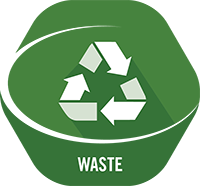 The purpose of the Waste badge is to encourage businesses to practice waste reduction. The EPA prioritizes recycling practices according to the following hierarchy: 1) Reduce waste at the source. 2) Reuse and repurpose materials. 3) Recycle. The City of Fort Collins supports these practices through a variety of programs and resources, click here for more information.